Roughly seven-in-ten black Americans (71%) say they have personally experienced discrimination or been treated unfairly because of their race or ethnicity, including 11% who say this is something they experience regularly. Far lower shares of whites (30%) and Hispanics (52%) report experiencing discrimination because of their race or ethnicity. Overall, four-in-ten black Americans say their race or ethnicity has made it harder for them to succeed in life, while about half (51%) say it hasn’t made much difference, and just 8% say it has made it easier for them to succeed. One-in-five Hispanics say their race or ethnicity has made it harder to succeed in life, while just 5% of white adults say the same; 31% of whites say their race or ethnicity has made it easier for them to succeed. When asked about specific kinds of discrimination that people may face, about half of black adults said that in the past year someone has acted as if they were suspicious of them (47%) or as if they thought they weren’t smart (45%). About two-in-ten blacks say they were treated unfairly in hiring, pay or promotion over the past year (21%) and a similar share (18%) say they have been unfairly stopped by the police over the same period. In each of these cases, blacks are more likely than both whites and Hispanics to say they have experienced these things in the past year. Large majorities of blacks across all major demographic groups say – at some point in their lifetime – they have experienced discrimination or been treated unfairly because of their race or ethnicity, including similar shares of men and women, young and old, and those with higher and lower incomes. Reports of discrimination are more common among blacks with at least some college education; 81% say they have experienced this at least occasionally, including 13% who say it happens regularly, compared with 59% and 8%, respectively, among blacks with a high school diploma or less. Among blacks who say they have personally experienced discrimination, equal shares say discrimination built into our laws and institutions is the bigger problem for black people today as say the bigger problem is the prejudice of individual people (44% each). Blacks who say they have never experienced discrimination are more likely to see individual discrimination rather than institutional discrimination as the bigger problem (59% vs. 32%). Among Hispanics, higher shares of those who are younger than 50 (58% vs. 35% of older Hispanics), have at least some college education (61% vs. 45% with no college experience) and are U.S. born (62% vs. 41% of foreign born) report having ever experienced discrimination. The share of whites who say they have ever faced discrimination or been treated unfairly because of their race or ethnicity is much lower than that of blacks or Hispanics. Still, three-in-ten white adults say they have experienced discrimination. When asked about some things people may have experienced because of their race or ethnicity, roughly half 0f black Americans say that, in the past 12 months, someone has acted like they were suspicious of them (47%) or like they didn’t think they were smart (45%). About half as many say they have been treated unfairly by an employer in hiring, pay or promotion (21%) or that they have been unfairly stopped by police (18%) because of their race or ethnicity over the same period. Whites are far less likely than blacks to say they have had these experiences. 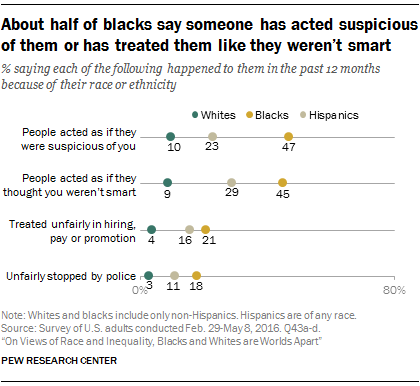 In fact, only about one-in-ten whites say that, in the past 12 months, someone has acted like they were suspicious of them (10%) or like they didn’t think they were smart (9%) because of their race or ethnicity, and even fewer say they have been treated unfairly by an employer (4%) or have been unfairly stopped by police (3%). Among Hispanics, about three-in-ten (29%) say someone has acted like they thought they weren’t smart and about a quarter (23%) say someone has acted as if they were suspicious of them in the past 12 months; 16% of Hispanics say they have been treated unfairly by an employer and 11% say they have been unfairly stopped by police because of their race or ethnicity. Black men are more likely than black women to say they have been seen as suspicious (52% vs. 44%) and that they have been unfairly stopped by police (22% vs. 15%) in the past 12 months. There is no significant difference in the share of black men and women who say someone has acted as if they thought they weren’t smart and who say they have been treated unfairly by an employer. Blacks with at least some college education are more likely than those with a high school diploma or less to report having been treated as if they were not smart in the past year because of their race or ethnicity (52% vs. 37%). Blacks with at least some college education are also more likely than blacks with no college experience to say someone has acted like they were suspicious of them (55% vs. 38%). With the exception of being unfairly stopped by police, perceptions of unfair treatment among blacks don’t differ significantly by family income. One-in-five blacks with annual family incomes under $30,000 or with incomes between $30,000 and $74,999 say they have been unfairly stopped by police in the past year, compared with 12% of blacks with incomes of $75,000 or more. Among Hispanics, those younger than 30 are more likely than those in older age groups to say they have been treated unfairly by an employer or that people have been suspicious of them or have acted as if they didn’t think they were smart because of their race or ethnicity. Nativity is also linked to these types of experiences. U.S.-born Hispanics are more likely than the foreign born to report being treated as if they were unintelligent (35% vs. 24%) or suspicious (32% vs. 14%) and to say they were treated unfairly by an employer in hiring, pay or promotion (20% vs. 12%). When asked whether their race or ethnicity has affected their ability to succeed in life, 40% of black adults say it has made it harder to succeed, while 51% say it has not made much difference and just 8% say it has made it easier. The share of blacks saying their race or ethnicity has made it harder to succeed is twice the share of Hispanics (20%) and eight times the share of whites (5%) who say this. For their part, a majority of whites (62%) and Hispanics (65%) say their race or ethnicity hasn’t made a difference in their success. But whites are about twice as likely as Hispanics to say their race or ethnicity has made it easier to succeed in life (31% vs. 14%). Black Americans younger than 50, as well as those with more education and higher incomes, are particularly likely to say their race or ethnicity has made it harder for them to succeed in life. About four-in-ten (43%) blacks ages 18 to 49 say this, compared with 35% of older blacks. Among blacks with a bachelor’s degree or more, 55% say their race has been a disadvantage, while 45% of those with some college and 29% of those with a high school diploma or less say the same. Additionally, blacks with family incomes of $75,000 or more are more likely than those with family incomes between $30,000 and $74,999 and those with family incomes below $30,000 to say their race has held them back (54% vs. 43% and 32%, respectively). For Hispanics, the share saying their race or ethnicity has made it harder to succeed is higher among women (24% vs. 15% of men) and among those younger than 50 (23% vs. 11% of older Hispanics). There are no differences by education level or nativity. While most whites say their race or ethnicity has neither helped nor hurt their ability to succeed in life, a substantial share (31%) say their race or ethnicity has made things easier, a view that is more common among whites with at least a bachelor’s degree and with higher incomes, as well as among those who are younger than 50 and who identify with the Democratic Party. About half of white college graduates (47%) say their race or ethnicity has been an advantage for them, compared with 31% of whites with some college education and an even lower share of whites with a high school diploma or less education (17%). Similarly, whites with family incomes of $75,000 or more (42%) are more likely than those with family incomes below $30,000 (23%) to say their race or ethnicity has made things easier for them. And while about four-in-ten (38%) whites who are younger than 50 say their race has been an advantage, 26% of older whites say the same. White Democrats are also far more likely than white Republicans and independents to say their race or ethnicity has made it easier for them to succeed in life. About half (49%) of white Democrats say this, compared with a third of white independents (33%) and even fewer (17%) white Republicans. In addition to seeing their race as a disadvantage to their lifetime success, blacks are more likely than whites or Hispanics to see their gender as being a disadvantage, a difference that is due in large part to the views of black men, who are more likely than white and Hispanic men to say their gender has made it harder for them to succeed in life. Among all Americans, women (27%) are more likely to say their gender has been a disadvantage in their lives than men (7%). On the flip side, 30% of men say their gender has made it easier for them to succeed in life, compared with 8% of women. Still, majorities of both men (61%) and women (63%) say their gender hasn’t made much difference in their success. Across each of the major racial and ethnic groups, women are more likely than men to see their gender as a disadvantage for their success. This gap is particularly pronounced among whites (27% of women vs. 5% of men), and Hispanics (22% vs. 6%). Among blacks, the gap between women and men is much narrower; 28% of black women and 20% of black men say their gender has made it harder for them to succeed. But black men are more likely than black women to say their gender has made things easier for them (18% vs. 10%), as is the case to a greater extent for white men (33% vs. 6% of white women) and Hispanic men (26% vs. 14% of Hispanic women). By and large, the perceptions women have of how their gender has shaped their chances of success do not differ across race and ethnicities. Black, Hispanic and white women are equally likely to say their gender has made it harder for them to succeed.